The cover of All Florida, a TV guide published by The Florida Times-Union, for November 17, 1963. 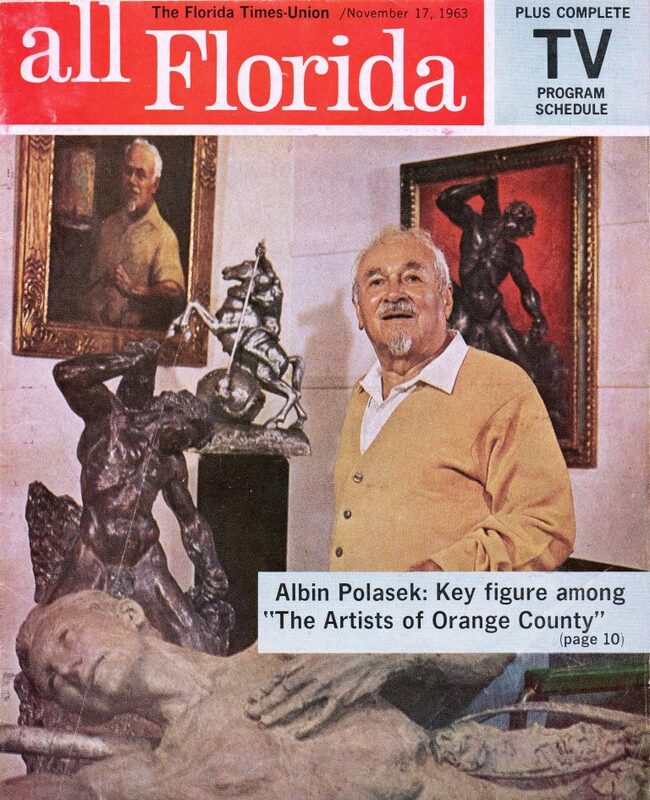 The cover features Albin Polasek, who was also featured on page 10 of the TV guide. All Florida also featured other artists from Orange County, including Hal McIntosh, Maury Hurt, and Bill Orr. Polasek is a local art legend in Orange County who is also recognized nationally and internationally for his work. Polasek was born in Frenštát pod Radhošt?m, Moravia (now part of the Czech Republic), on February 14, 1879. He later migrated to Vienna, Austria, where he apprenticed as a woodcarver. In 1901, at age 22, Polasek immigrated to the Midwestern United States. At age 25, he began attending the Pennsylvania Academy of Fine Arts in Philadelphia, Pennsylvania, where he studied under Charles Grafly. Two of his most well-known sculptures were created while he was a student: Man Carving His Own Destiny and Eternal Moment. Polasek was granted American citizenship in 1909 and he earned the Prix de Rome in 1910, which granted him a three-year fellowship at the American Academy of Art in Rome, Italy. He also received the Paris Salon for The Sower in 1913 and the George D. Widener Memorial Gold Medal from the Pennsylvania Academy of Fine Arts in 1915 for Aspiration. After completing his studies in Rome, Polasek migrated to New York City, New York. In 1916, when he was 37, the Art Institute of Chicago in Chicago, Illinois, invited Polasek to head its sculpture department. While in Chicago, he sculpted Forest Idyl, Victorious Christ, and The Spirit of Music. In 1927, he was elected as an Associate Member of the National Academy of Design, which is an honorary degree conferred to America's top painters, sculptors, and architects. Polasek also achieved full academician status in 1933. 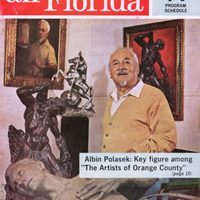 Original TV guide cover: The Florida Times-Union, November 17, 1963: Albin Polasek Museum & Sculpture Gardens, Winter Park, Florida. Digital reproduction of original TV guide cover: The Florida Times-Union, November 17, 1963. Originally published by The Florida Times-Union. Copyright to this resource is held by the The Florida Times-Union and is provided here by RICHES of Central Florida for educational purposes only. “All Florida, November 17, 1953.” RICHES of Central Florida accessed April 26, 2019, https://richesmi.cah.ucf.edu/omeka/items/show/5171.